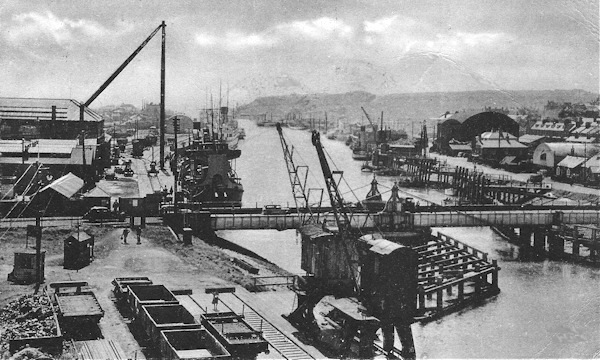 Newhaven swing bridge, 1930s. The "Sheer legs" (crane) on the left was cut down in the early 1960s, by leaning them forward over the river and knocking out the pin that held the back leg onto its movable mounting.The legs were then pulled from the river and cut up. The low wagon in the right foreground appears to only have bodywork on the side and the far end. Oddly, in the no doubt all-male area of the North Quay, there is a lady standing behind the double bolster wagon. She's holding something – a baby, perhaps? There's a bucket dredger near the sheerlegs. For a long time in the 1960s, this berth was home to the "AA Raymond", which seemed to be undergoing a never-ending refit, before being moved to the west side below "Sleepers Hole" where the work continued apace slowly. The large black building on the right was used to make wagon tarpaulins. Behind this, the West Quay branch made its way to the West Breakwater.